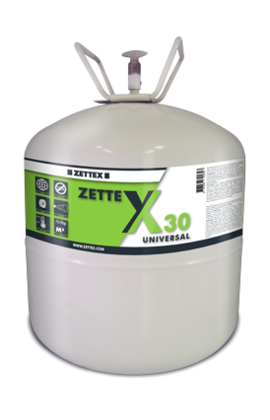 Zettex Spraybond X30 Universal is a very high quality heat-resistant contact adhesive for the adhesion of the most common building- and industrial materials. Zettex Spraybond X30 Universal is suitable for the adhesion of rubber, cork, linoleum, wood, HPL, Polyether and so on. Zettex Spraybond X30 universal is having temperature resistance of 110°C. For gluing all types of EPDM (American and European) and almost all types of roof covering, on all surfaces. Spraybond X30 Universal has various test certificates and has been approved under the new standards of the ATG and the EU directive on surface adhesives. Remove any moisture and grease from the surface being glued. Gently spray the contact adhesive onto both surfaces being glued. The ideal distance between the surface and the spray gun is 30 cm. Try to apply the glue in a single layer. Bring the surfaces together after 2-4 minutes and press or roller firmly. Wait at least twice as long to glue the surfaces together if the layers applied have overlapped. Check thoroughly to see whether there is sufficient contact between the glue layers if the surface is porous. Apply an extra layer, if necessary. All surfaces should be dry and free from grease and dust.